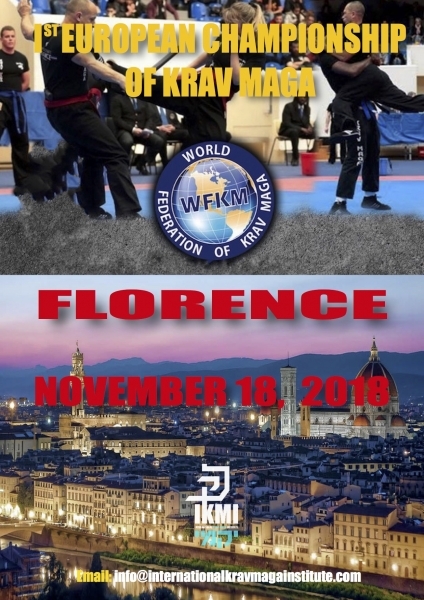 During the WFKM meeting on October 23, 2017 in Jerusalem, Italy was named as the host country of the first edition of the European Technical Krav Maga Championships. An exceptional event that will be attended by delegations from many countries, including France, Germany, Austria, Bosnia, Israel, Belarus, and more. It is not a fight in the traditional sense of the term. It is a technical comparison between two teams, each team consists of two athletes. This pair can be made up of two men, two women or even mixed. Each team interprets a technique from a situation of aggression. To do this, each team has about 1.30 minutes and the technical interpretation must be continuous and propose logical and realistic solutions that respect the pragmatic principles of Krav Maga. It is an opportunity for technical growth that is given to our athletes and instructors to find pragmatic solutions to situations of aggression. This is also an opportunity to increase the variety of techniques on which to train and consequently its technical Krav Maga knowledge. What then these situations are judged by arbiters must not lead to the mistake of thinking that it is just a fiction and that the true Krav Maga is snapped. Those who take part in TKM usually follow the Krav Maga courses exactly like the others, in fact, adds more to this type of workout. Even if these situations are judged by referee, it must not lead to the mistake of thinking that it is just a fiction and that the true Krav Maga is degenerated. Who participates in the TKM normally follows the courses of Krav Maga just like the others, but in plus, adds even more this type of training. Each of us when training at the gym, repeats exactly the same motions of TKM with the same control and fortunally that the motions are the same, otherwise there would be many more incidents. Of course the principle of control applies both during the workout in the gym and in the face of aggression in the streets, (principle of proportionality in self-defense). In fact, the purpose is to resolve the situation to its advantage in the shortest possible time and to move away from the danger zone. The TKM proposes exactly this goal.